Renewal requirements for business licenses for charities? Charities operating in multiple states are often required to obtain and maintain charitable solicitation registrations. Most registrations have some type of annual reporting requirement. Specific renewal documentation and due dates vary by state. Some states, such as California, New Jersey, and Washington, require both an annual renewal application and an annual financial report. Sometimes the submission of IRS Financial Statements (i.e. Form 990.) is sufficient for the annual financial report. Sometimes a customized state form must be filed. Other states, such as New York, Illinois and Massachusetts, do not require an annual renewal requirement, but do require IRS Financial Statements (i.e. Form 990) to be submitted annually. Renewals may be denied if the documentation is not submitted in a timely manner or the application is insufficient. Generally, a charity cannot simply let their registration lapse. The state will assume that the charity remains active once it obtains a charitable solicitation registration. If a renewal or annual report is not submitted, the charity may face large fines or legal action by the state. For a charity to close, most states require a dissolution agreement. In Florida, if a charity does not renew their registration by the annual due date, they will be fined $25 per month as a “late fee” regardless of whether they choose to dissolve the charity or continue it. In Alabama, an applicant must file with the Attorney General a Notice of Non-Renewal for Charitable Organization if and when it chooses not to renew their charitable solicitation license. 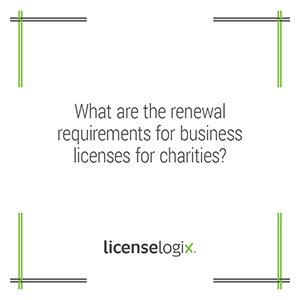 LicenseLogix will help guide charities through the entire licensing process, whether they are seeking an initial license or managing ongoing renewals. We can help you obtain all of the licenses and registrations you need, minimizing time-consuming and costly delays. For additional help you can fill in the form on the bottom or give us a call at (800) 292-0909.